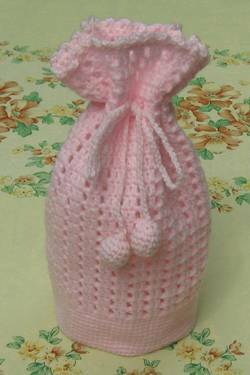 This little crocheted bag reminds of a dorothy bag that I had to sew by hand in sewing class, way-back-when. This one is designed to fit the Amigurumi dolls available at the KandJDolls blog. I think this bag is very pretty and, with an approximate size of four inches (10cm) on the bottom diameter, by ten inches (25.5cm) high, it could have many uses. The original was made with 4 ply acrylic yarn and a 3 mm crochet hook. Rnd 15: Working in back loops only. Sc in each st around. Rnd 16-23: Sc in each st around. Rnd 24: Sc in each st around, join with sl st in first st.
Rnd 25-47: Ch 4, skip 1 st, dc in next st, (dc in next st, ch 1, skip 1 st, dc in next st) around, join with sl st in first st.
Rnd 48: Ch 1, sc in same st, (sc in next ch, sc in next 2 sts) 27 times, sc in next ch, sc in next st, join with sl st in first st.
Rnd 49: Ch 1, sc in same st, ch 3, sc in next st, (sc in next st, ch 3, sc in next st) around, join with sl st in first st. Fasten off. Put the string through the holes on rnd 43. Sew small balls to end of chains.